Home / Easy Play “No Sore Fingers” Guitar Strings…Stop finger pain now! Easy Play “No Sore Fingers” Guitar Strings…Stop finger pain now! 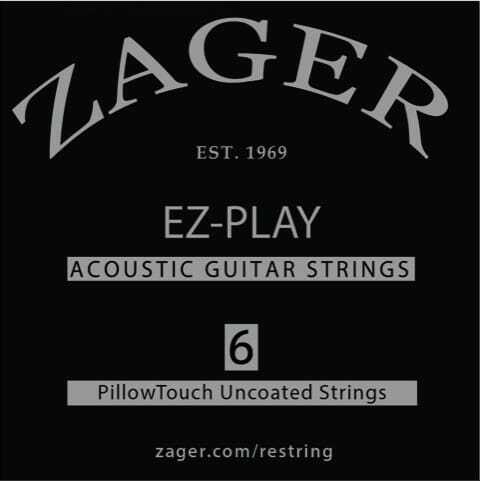 Zager Easy Play “No Sore Fingers” Guitar strings take away pain and allow you to play longer and move faster with less fatigue and soreness. Makes any guitar easier to play. 70 years of research has created what pros are calling the best guitar string on the market today. Used by Lady Gaga, Garth Brooks, Bruce Springsteen, Peter Paul & Mary, and Johnny Cash. Try a set on your own guitar and if they aren’t the best strings you’ve ever used we’ll refund 100% of your payment. Hand wound daily in Lincoln, Nebraska. LOVE THESE STRINGS!!! Seriously the best string for acoustics I've found. They almost feel like electrics but they put off a huge sound. Not slimy like Elixir polywebs. On my 3rd month and counting they really do last forever. PUT THESE ON YOUR GUITAR AND YOU WILL NOT BUY A DIFFERENT BRAND AGAIN. THEY FEEL AMAZING AND SOUND PROFESSIONAL. INTONATION IS SPOT ON. GREAT FOR FINGERPICKING TOO. My opinion is that these are really nice sounding acoustic strings. It lasts a long time and I like the gauge they came in. Makes it easy. I have to agree that these are very nice guitar strings. The price is right and they do last longer. I'm still playing strings I bought last month which usually isn't the case with my strings. They hold their tone and don't get grimey and discolored. Love the guitar strings from Zager. The reputation of Zager Guitars is very well known as being fantastic however I haven't put these strings on my 80CE yet they still have the Pures on which I love. When I put the pillow touch's on I bet I will like them a lot too. They have been highly recommended to me and I already love my guitar so much. Not sticky or gunky like a lot of coated strings are. Zager got it right with these and I'll recommend them to friends for sure. I'm finding they last about 3x as long as uncoated strings. Nice chunky fat sound. Rings out and stays in tune. Am a fan of the coated strings! I would like to say thank you to Denny for releasing a coated string line. They are fantastic, sir. You have many years of knowledge and it shows with your guitar accessories because they are smart products. This is me and my grandpa when he was first teaching me Beatles tunes the summer of 6th grade. Now years later, he recently said to try Zager strings when I asked about trying a new string brand after getting bored with Ernie Ball and D'Addario. I wanted to see what their coated strings were like so I ordered them and I like the coated strings a lot. He wants the Pures and I go for the Pillow Touches. We love our Zager strings. Strings are a personal decision ok and I've tried a lot of brands including D'Add, Martin, Elixir of course, Ernies and more. I have to admit I like Zagers for the value and they include their funky little pick which is so great and shows they have a brain for guitar playing. Denny's got experience and did well with these. Got 6 packs and am not regretting it. 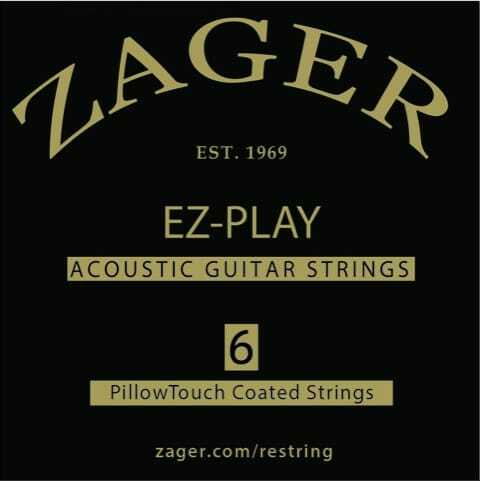 Zager's got something going with these coated strings. THey last a long time and sound so so good. Just as described. Seems like they will be popular. Happy to review this product and say I like it. Mr. Zager has come out with a stellar product and we will be buying more when we need to. Congratulations on a fine item. Nothing wrong with these strings they do their job and sound excellent on my acoustics. GREAT! THANKS! Great service and I love these strings. You search and try all the strings at the store and they're all different. These I love and will buy again. Everything I expected. Consistent quality. worked well. like that they come in 3 packs so I can change often like I like to. I usually fingerpick and sometimes strum -- just your typical living room player who's too chicken to perform -- and I've used these with small body and dreadnaught Martins and Gibsons and of course on my Zager all with sweet results. I found that they last as long as coated strings like EXPs and Elixirs and sound better. I like the free pick too, thanks ZAGER! I used Elixirs for almost 10 years...Zager is my new favorite string. Really easy on the hands and they sound better then Elixir Nanos. I don't know if they feel like pillows but it is the softest string I've ever used...makes my guitar play easier and they last forever...going on my 5th month! Made for players who don’t like the feel of coated strings. Made for players who don't like the feel of coated strings. Good tone and easy on the fingers. Ready to re-string all of my musical instruments now. Amazing, richer and deeper tone. I have tried almost every string brand there is, including independent companies. Zager is by far my favorite brand. Zager strings are the real deal. Great sound, great quality and our favorite. Quick delivery and a great price, and love the sound. Good price. Good shipping time. 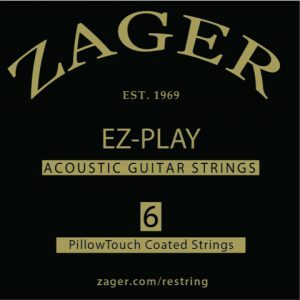 Zagers are always great strings! great strings for the acoustics. Never disappointed in Zager products. Shipped right away - strings were great! I like how my guitar sounds brighter with these strings ! This was exactly what I wanted! Great price, great shipping time (two days)! I couldn’t be happier!! Will continue to buy the same guitar strings from them for the rest of my life! They’ve earned my trust and for that I choose to put my loyalty into their hands. Thanks so much!! Warm and bright. Can’t go wrong with Zager! We love these! Always the number one choice for all my friends and me. Trusted brand, one that I often purchase. They always have a decent sound and are well known. Do recommend. Love these strings! Very affordable and we are very pleased with how long they last! Got to have strings! These work great! These are my go to strings for a few years now. Good quality and last quite a bit. If you want good strings that don't break the bank Zagers are ones you can depend on time and time again. BEST STRINGS IV'E EVER USED. PRICED RIGHT. These strings are the best and this is a great value for someone who changes a lot of stings. Nice warm tone as compared to the coated strings I've used, luckily my hands don't destroy strings like some folks. I can get a month or two out of a set with heavy daily playing. My stand by strings for years. I've tried other strings and for the price I don't think there worth it, these last as long as I want them too and more. 3 packs save money and give me some extra packs as a back up. I've been so happy with these so I have no reason to change. I used to use the medium but have played with the lights for a while, just easier on my fingers. Sounds bright and crisp tone. Not sure if they're the best, just what I've become accustomed to and I'm glad to be picking with them.